Join Amber as she quizzes contestants on a range for topics. Panelists are Jamie, Cas and Jake with snarky sidekick Faith. Join Amber as she quizzes contestants on a range for topics. Panelists are Jamie, Cas and Faith with snarky sidekick Jake. Join Amber as she quizzes contestants on a range for topics. Panelists are Lucy, Meg and Marc with snarky sidekick Patrice. How to chemistry videos with BMHS honors chemistry students. Join Amber as she quizzes contestants on a range for topics. Panelists are Scott, Ben and Adam with snarky sidekick Patrice...Sort of. Join host Lilly as she tests the knowledge of 10-14 year old kids. Join host Faith Brodi as she tests the knowledge of 10-14 year old kids. Join Amber as she quizzes contestants on a range for topics. Panelists are Jake, Faith and Cas with snarky sidekick Jamie. Join Amber as she quizzes contestants on a range for topics. 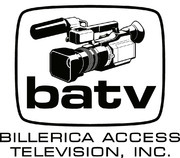 This special edition of The Quiz features the staff at BATV. Panelists are Sam, Nancy and Karen with snarky cameraman Paul. Kayla and Tara shout in from the control room. Join Amber as she quizzes contestants on a range for topics. Panelists are Surly Temple, Down N' Jersey and Toxic Marcotic with snarky sidekick Patrice and special guest Homeless Harry. Join Amber as she quizzes contestants on a range for topics. Panelists are Faith, Casper and Jamie with ghost-host Margaret. Highlights from the 2018 Billerica Clean Up Green Up activities. Info on the BMHS Senior all-night graduation party. A cooking episode with Rita and John DiClemente. A compilation of programs produced by members of the Spring 2016 BATV Youth Programs. Join us on a trip through some of BATV's past youth programs! A compilation of projects from the 2017-2018 BATV middle school enrichment program. A compilation of projects that were put together by members of the BATV Summer 2016 Youth Programs.